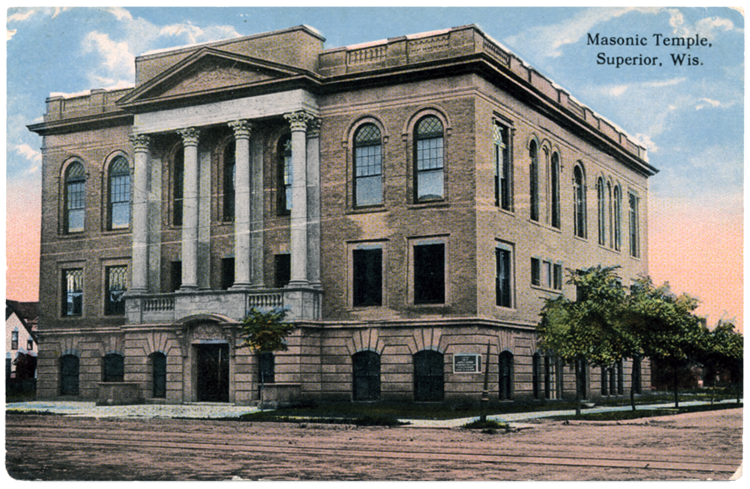 Superior’s Masons built this Classical Revival hall, complete with four two-story columns topped by Corinthian capitals, in 1906—but left no record of who designed it, or what went on inside. The Masons of Superior (like all Masons, a secretive lot) first organized in 1884 and had built several halls in the city by 1900. In 1982 the Masons left, and the Elks moved in. Today the Superior Masons meet in Billings Park. Masons who helped shape the Head of the Lakes include John Jacob Astor, who owned the American Fur Post at Fond du Lac; J. P. Morgan, whose U.S. Steel built Morgan Park; and John D. Rockefeller, who bought out the Merritt Brother’s mining interests on the Mesabi Iron Range. Many prominent residents of the Twin Ports, including Superior’s Martin Pattison were also Masons.